Perhaps you would like to combine a visit to our tea room with something else on the Sefton coast, We are happy to give you a few ideas here. Our Tea Room will be opening again this summer on Fridays, Saturdays and Bank Holiday Mondays (11am to 4pm) from 26th April until 26th August 2019. Call in and visit us. We are looking forward to seeing our ‘old’ friends and welcoming our new ones. You can see our menu here. Our Tea Room is named to recognise that Formby is the home of the first Lifeboat Station in the world. The Lifeboat Service plays a vital role in saving lives and we also recognise that same role in our Christian faith – that Jesus is our spiritual Lifeboat and he also comes to save lives. Why not take the opportunity to visit our beautiful church and woodland grounds and enjoy refreshments served to your table either in our Meeting Room adjacent to the church, or at one of our outside tables (dog walkers are welcome). Freshly made sandwiches, soup, cakes and beverages are available – we can even do take-outs. You may also want to visit the remains of the Lifeboat Station which is located on the beach nearby or view our display about the history of the Lifeboat Station in Formby and the work of the RNLI in the Tea Room. The RNLI Lifeboat Day with the Shanty Kings is booked for Saturday 13th July. 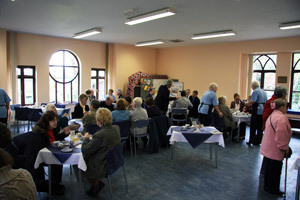 Come on your own or in a group - you are assured of a warm and very friendly welcome. Group bookings can be made in advance to (01704)877972 to ensure we are prepared for your visit.